Organizing Playroom - Home Organize It! When kids play, it is almost a certainty that there will be a mess to clean up after they are done. By having a playroom in the house, it can help keep the toys from taking over the rest of the house, including their bedrooms. But, how do you keep the playroom from getting to the point there is no room to play? Here are a few tips, including how to get the kids to help. Start with sorting through all the toys and finding the things that they never play with anymore. Have they outgrown them? Are the broken? Make piles of things to pass on, or sell in a garage sale, things to throw away and things to keep. Sort the toys by type and then you can decide if you need to change the way they are stored. You may not have to get anything new; you may have enough containers that aren't being used in other rooms around the house. To help the kids put things away, borrow an idea from classrooms: label everything. Make signs, either with words, pictures cut from magazines or both, and attach them to the various containers and shelves. The kids then have a clear guide for putting things away. It also helps when they want a specific toy - they can just look for the signs and know where to look, that is if they've put things away. Another way to help reduce the chaos is to reduce the number of toys in the room. Divide the toys into groups, some to pack away for a time, and some to have out. Store them in a closet, the basement, or anywhere else they will be out of the way. When the time comes to swap the sets of toys, it's almost like getting new toys without buying anything else. Changing the way toys are stored can also help. By having easy access containers, the kids can put things away more easily. Younger children can have a hard time with lids, but there are nice fabric containers that are flexible and are safe for them. Some of these come designed to look like animals or people and are a lot of fun. Clear plastic containers are also great because the kids can actually see what is in the box before digging through the whole thing. Stuffed animals seem to multiply like real rabbits at times. There are a few options for corralling those critters. There are Velcro poles that the animals stick to. They can be tucked in a corner and do not take up much space. There are also stuffed animal hammocks that can be hung up to save floor space, but these should only be used with older children. Have them at a height where they do not pose a choking hazard. The biggest key to keeping it all under control is maintaining it every day. Get the kids into a new habit of only getting one thing out at a time and putting it back when they are done. 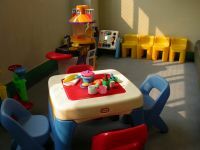 If this is too hard, then reduce the number of toys available, increasing them as the kids get used to the new system. Return from Organizing Playroom to Home Organize It!